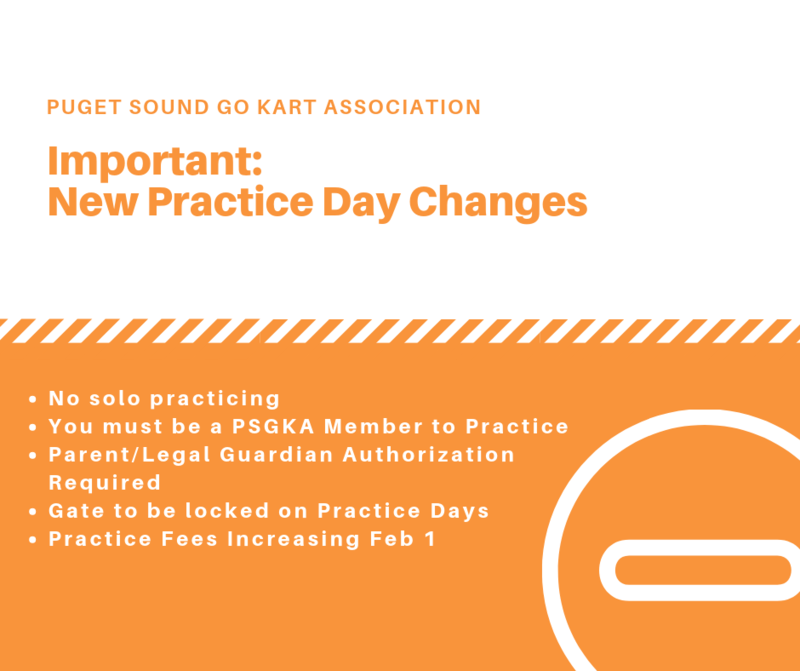 (IMPORTANT) New Practice Day Changes for 2019! No solo practicing. You must have an observer who can call 911 in the event of an emergency. That observer can be another driver, so come with a friend. You must be a PSGKA member to practice. Annual membership is still $300, a one-day membership is $35. (You do not need to be a member to race). One-day members must be accompanied by an annual member. Annual memberships are due January 1, so sign up today! The gate will be locked on practice days. Be sure to get a key when you sign up for your membership. Please close and lock the gate after you enter and again when you leave. This is to prevent unauthorized access to the restricted areas. As a member, security is your responsibility! Practice fees are increasing February 1. Driver fees will be $10, non-driver fees will remain $5. This increase is to cover the rise in insurance costs. Total cost to practice for annual members is $10, for non-members is $45 ($10 practice plus $35 one-day membership).